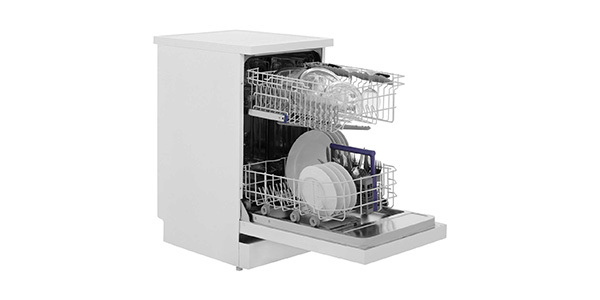 If you want an inexpensive slimline dishwasher, the Beko DFS05010W is a great option. While it might be lacking in some of the features that you would expect from more expensive machines, this model has all of the programs that you need and it performs well. At this price, it is hard to beat the value that you get with this slimline dishwasher from Beko. If your kitchen is limited on space, the Beko DFS05010W offers a nice low cost option for washing dishes. The user gets good cleaning performance from a machine that is easy to use, and it does offer some nice features and options. At 237 kilowatt hours of estimated annual energy consumption, it is also fairly efficient. For interior racking, you could certainly do better, but the space is well managed and it can fit a good amount of dishes. The maximum capacity for this machine is 10 place settings, and it has a removable cutlery basket and a top basket that is height-adjustable. It’s not the most versatile interior, but it is not complicated to load, and it should provide enough for most users. While this is one of the more basic slimline models out there, this machine does come with a nice set of features and programs. You have five program options and a setting for washing half loads. 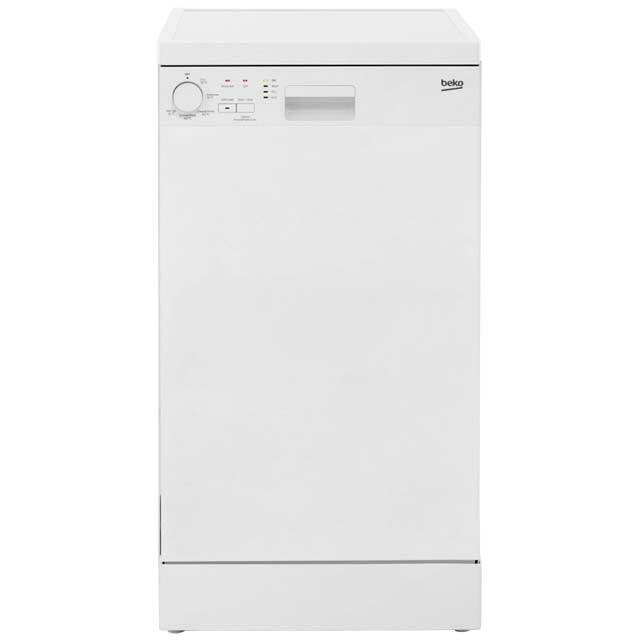 The machine has intensive wash, economy, clean & shine, quick & shine and a quick wash.
For performance, this slimline model from Beko does well. All of the settings provide good cleaning results, and the cycle times are not excessively long. You have the quick wash that takes about 30-minutes, an intensive cycle that takes just under two hours, the normal setting that takes about an hour and a half and the economy setting takes the longest to complete at about three hours and twenty minutes. Being one of the simpler dishwashers that you will find, this machine is very easy to operate. The interior does not offer a lot of options, but it can be loaded quickly, and it has controls that are easy to understand. Just select a cycle by using the dial and then press the start button. This Beko dishwasher does not have a display, but it does have indicators that show the progress of the cycle. This is also a machine that seems to be well made and easy to maintain. The interior is stainless steel and it does come with overflow protection. With this model, it is also easy to refill the salt and the rinse aid, and you can make adjustments to the rinse aid use. The filter is also removable and washable, so it should be good for the life of the machine. Overall, it is a good machine for the price, and it should last for a good number of years.